Theo Alice Ruggles Kitson, 1941. 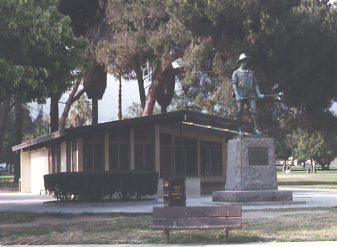 Arcadia Park, SW corner of Huntgington Drive at Santa Anita. One of more than 52 replicas in the U.S. Foundry/Fabricator: The Gorham co, Providence, Rhode Island. Text from the plaque: "Dedicated to those who served in the War with Spain, The Philippine Insurrection and China Relief Expedition, 1898-1902. Presented by the County of Los Angeles, the United Spanish War Veterans of Southern California and Friends, 1940." Image from SOS! Los Angeles outdoor sculptures file.